NTFS Recovery Wizard is designed to handle the NTFS specific issues, providing best possible results. See What You Get – Free! With NTFS Recovery Wizard, you always get exactly what you see. The Live Preview feature ensures your ability to recover a given file or document by producing a complete preview of that file or document. And we aren’t talking about a ‘hex’ preview of random numbers and symbols. Instead, NTFS Recovery Wizard shows your Word documents as Word documents, and your digital images as viewable pictures to let you examine the quality of the recovery before you pay a cent. Access and recover files from inaccessible, unreadable, damaged and corrupted files. Recover files from formatted and repartitioned disks, even if new data has been already written. Recover information from disks with damaged partition tables, MBR and system records. You can restore files and folders from damaged, corrupted, inaccessible and unreadable hard drives completely by yourself with a simple, easy to use wizard. Emptied Windows Recycle Bin? Accidentally formatted a disk? Tried using Windows checkdisk on a damaged disk? No need to bring your hard drive to a data recovery lab! Save time and money and use NTFS Recovery Wizard to recover your data completely automatically. Try reading about NTFS and the recovery techniques, and you’ll be lost for weeks. NTFS Recovery Wizard knows a lot about the internals of the file system, using this knowledge to help you get your data back. Run the wizard, choose your disk, and click ‘Next’ to start the job! It’s that simple, and it works for all NTFS drives including the badly damaged ones. NTFS Recovery Wizard does the job at no extra charge even if you tried to fix it yourself with other tools! The Easy Recovery Wizard sure looks simple, but the recovery algorithms are not! NTFS Recovery Wizard benefits from years of constant development, and employs the most sophisticated data recovery technologies available on the market. The proprietary PowerSearch technology makes it possible to locate lost and deleted files on formatted or badly damaged disks. Unlike other data recovery tools, NTFS Recovery Wizard does not rely exclusively on what Windows knows about your files. Instead, it scans the entire surface of your hard disk in low-level mode, reading sector by sector. The process is slow and takes significant time to complete, but allows NTFS Recovery Wizard to locate files that would be otherwise lost forever. The PowerSearch technology uses advanced signature analysis techniques similar to those employed by anti-virus scanners to detect the beginning and end of documents in recognized formats. Your work, pictures, archives and every other piece of user-created content are our top priority. Why restoring all those EXE and DLL files you can easily get by simply re-installing the system? Instead, NTFS Recovery Wizard makes every effort possible to locate and recover the files you created before it starts looking for other files – such as EXE or DLL. PowerSearch is able to discover and save over a hundred file formats, including Office documents, digital pictures in various formats, RAW images from digital SLR cameras, ZIP and RAR archives, and various audio and video files. Even if half of your hard disk is completely dead, NTFS Recovery Wizard will recover the important stuff from the other half! Not sure if NTFS Recovery Wizard is the right tool for you? Here’s the list of real-world situations where NTFS Recovery Wizard was able to help. The user emptied the Recycle Bin on Windows desktop. NTFS Recovery Wizard recovered the deleted files. A disk volume with valuable documents was damaged due to a system failure. NTFS Recovery Wizard recovered all documents and repaired the volume. A disk was damaged by a virus. NTFS Recovery Wizard fixed the disk. The user cleaned the virus with a third-party antivirus. Windows made the hard drive inaccessible. The user could not access the disk with documents. 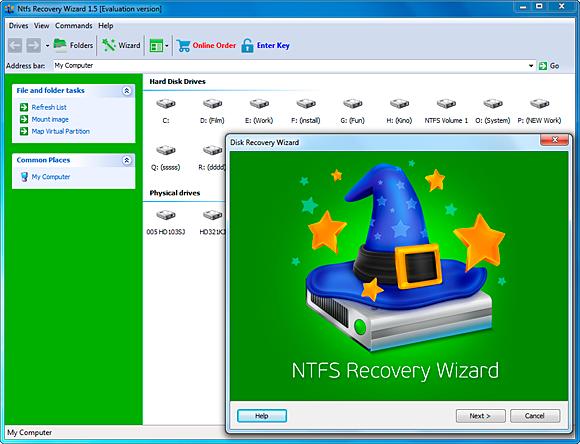 NTFS Recovery Wizard recovered all documents, fixed the damage and restored disk access. The user formatted a disk. This was easy: NTFS Recovery Wizard was able to un-format the disk in a few minutes. User’s files were unreadable because of file system corruption. NTFS Recovery Wizard saved inaccessible files onto another disk, and fixed the file system. The user lost all of the disks due to damaged partition table. NTFS Recovery Wizard was able to recover the user’s work and restore the disk.